Reception: August 4, 2017 | 5:00 – 9:00 p.m. The arts often reward the struggle with our physical limitations with an opportunity for expression and connection with others that goes beyond what we can say in more concrete ways. In this exhibit featuring artists from The Studios at LOGAN, we see another facet of this process by celebrating the work created by people with developmental, physical, and/or intellectual disabilities. The exhibit shares some of the history and evolution of the arts at LOGAN. Individual pieces include the work of the late Martha McMillian, whose spirited depictions of South Bend landmarks can be found on display by friends of LOGAN around our town. Her work shows how much more vibrant her life became when she left a segregated institutional setting to participate more fully as a connected member of the community. Other contributions by current Studios participants include work by a young woman whose muscle function gives her the use of only one hand, but whose brushstroke cannot be matched, a young man who had limited opportunity to work with the arts but with opportunity and instruction quickly began creating freehand drawings, and an exuberant young woman who has found a focus for her tremendous energy and personality through paint, clay, and other media. 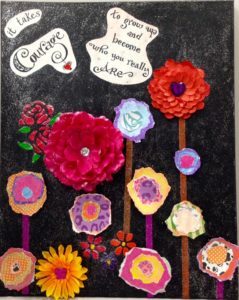 There is also abstract work showing the beauty that individuals who have significant intellectual disabilities can create when given materials to use and the chance to freely express themselves. The exhibit also features collaborative projects, further exploring what we can create when we connect and work together. 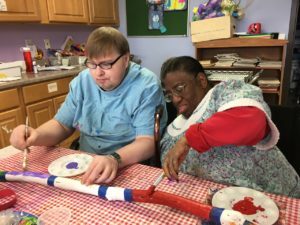 There are large group efforts such as a “tie-dyed wave” of brilliantly colored splashes of paint diffused on filter paper and painted walking sticks that show how diverse individual contributions can come together to form a cohesive whole. A bison painted by a class as part of Indiana’s 2016 Bison-Tennial project represents the St. Joseph County community. This design, implemented by artists who are often overlooked, uses visual icons to be accessible to everyone and to draw viewers into seeing and discussing what our community has to offer. Some works are the efforts of small groups—one person may paint the background, and another may add pictures and words. One person may sand, another add a base coat, and a third may add details. Textures created by one person may be shared to be incorporated into someone else’s work. Looking for what everyone has to offer, we find more than any of us could do on our own. For these artists, disability is part of their story, but should not limit or define their work. Just as rhythm and rhyme give structure to poetry, or painters work in 2 dimensions, or sculptors factor realities of gravity into their design, we all seek to transcend limits. Seeing the work artists create at LOGAN challenges all of us to believe in everyone’s potential, to appreciate diverse ways to communicate, and to find creative ways to work through challenges. The Studios at LOGAN is a weekday adult day services program where age- and skill-level appropriate activities are provided to engage men and women creatively, socially and mentally. The goal at Studios is to support individuals in making a valued contribution. This may occur through building relationships, expressing creativity, earning a commission on selling their creations, taking pride in learning and accomplishment, and participation in their community.